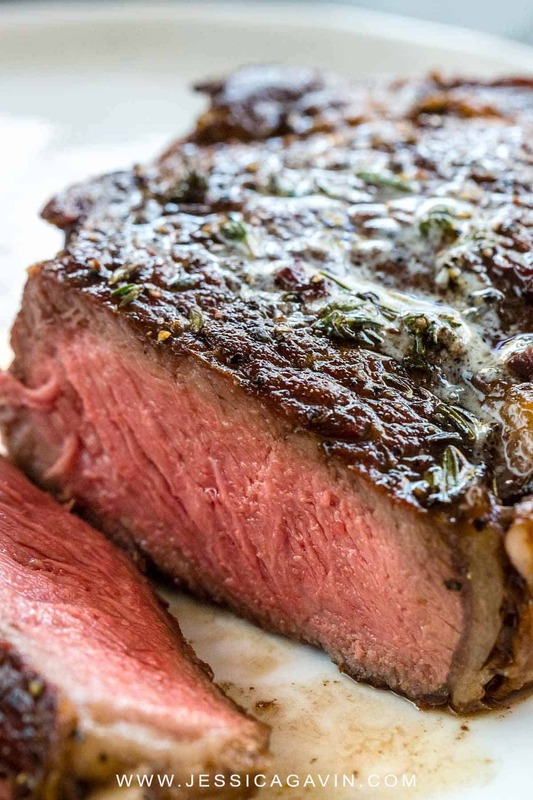 The reverse sear method might change the way you cook a thick steak forever. The process involves baking in the oven followed by searing on a pan. I’m a fan of this technique as it provides more control of the internal temperature, a stunning browned crust, and a more tender piece of beef. 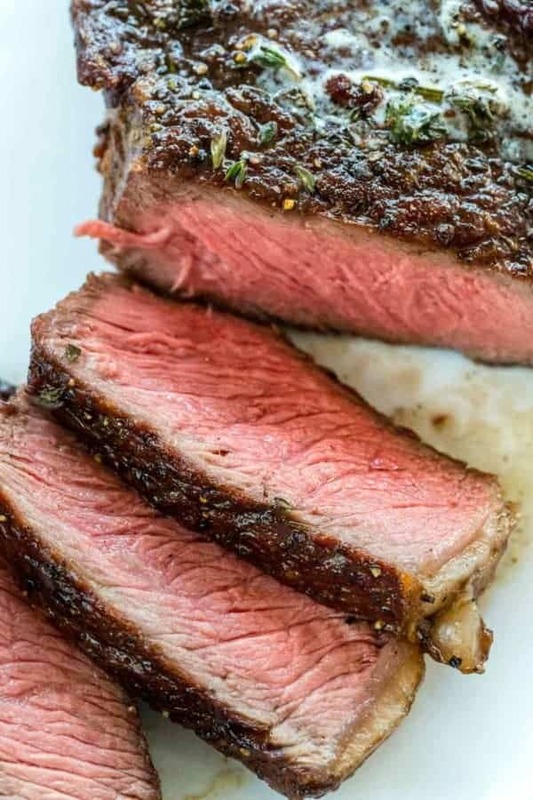 Most home cooks have prepared a thick cut of filet mignon or ribeye by pan searing, a conventional method to get a golden crust and pink center. However let’s be honest, sometimes you nail just the right temperature, and other times the beef is too rare or just slightly overdone. This process can be especially frustrating when you’ve paid big bucks for the better cut of meat. 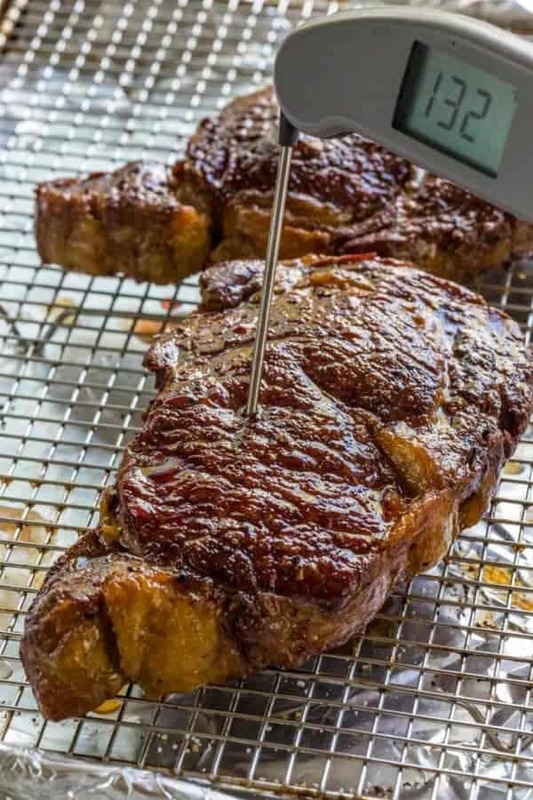 The good news, using the reverse sear steak method will allow for more controllable odds of making the perfect steak while maximizing its flavor. With just a few simple changes like gently cooking the beef at a low temperature in the oven first, and then searing it at the very end will undoubtedly result in delight and high fives! Follow this step-by-step guide on how to reverse sear a steak. 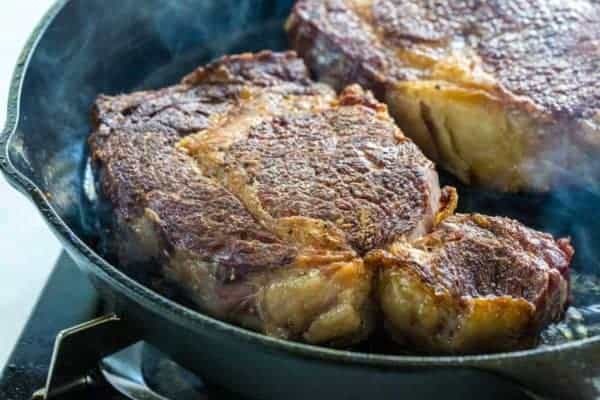 Instead of searing the steaks first in a hot pan until cooked to the desired doneness, thick cut steaks are heated in a moderately warm oven at 275°F (135ºC) and then seared afterward in a preheated cast iron skillet. The warm oven dries the surface which removes the moisture for more efficient and effective pan searing later on. Slow and even heat in the oven provides more control and prevents overcooking. More consistent pink internal color, while limiting cooked grey edges. A thick cut of beef can be gently cooked to nearly the right level of doneness. Pan-searing at the end of cooking in a preheated cast iron skillet creates a beautiful crust by the Maillard Reaction. Finishing the cooking in a pan allows for a flavorful sauce to be made using the fond and pan drippings. More affordable than using a Sous Vide, but a similar cooking process. Cooking a steak using this method is best for thicker cuts, minimum 1 1/2-inch to 2-inch thick pieces. Anything below will cook too quickly. Chose quick cooking, high-quality steak (USDA prime or choice) with some marbling, like ribeye, top sirloin, new york strip, porterhouse, or filet mignon. Place the oven rack in the center position and another below in the lower third. Preheat the oven to 275°F (135ºC). Place a large cast iron skillet or heatproof pan in the oven to preheat. This process will kickstart the cooking process and speed up the time it takes to sear the surface. Line a baking sheet with foil and then place a wire rack on top. 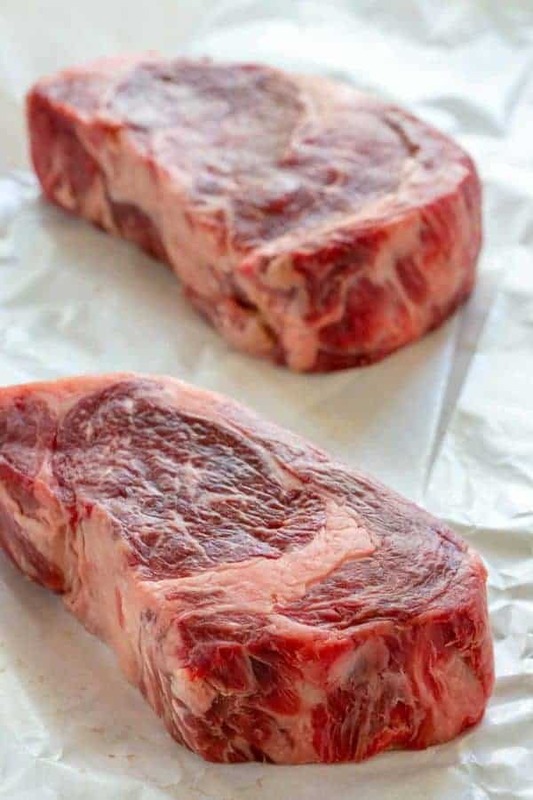 Dry the surface of the steaks with paper towels to remove excess moisture. Place the steaks on the wire rack and season both sides with salt and pepper. 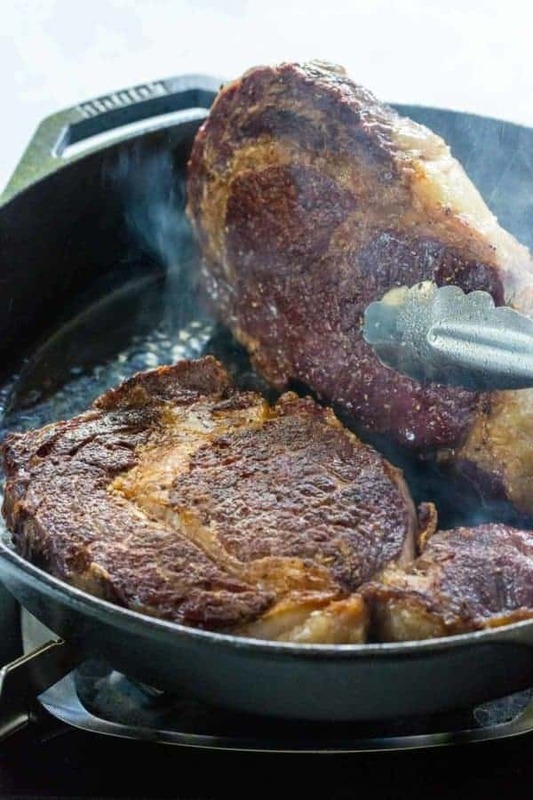 The steaks will finish cooking in the skillet and continue to increase in temperature, so you don’t want to cook the steak in the oven completely. Remove pre-heated cast iron skillet from the oven and transfer to the stove top. Turn the heat to high, once the pan is hot add oil that has a high smoke point temperature. I use vegetable oil or clarified butter like ghee. Sear the steaks on each side in the hot oil or fat for about 2 minutes, or until the desired doneness internal temperature is reached. Aim for an internal temperature of 120 to 125ºF (49 to 52ºC) for medium-rare or 130 ºF (50ºC) for medium. An option is to add 1 tablespoon of butter at the end of cooking. The hot melted butter is spooned on top to baste the steaks for enhanced browning and flavor. Sear the sides of the steaks to render the fat, about 30 to 60 seconds per side. Remove the seared steak from the pan to a clean plate or wire rack set on a baking sheet. Allowing to rest gives the carryover cooking a chance to finish heating the steaks. Typically the internal temperature will rise about 5 degrees in 10 minutes. Keeping in mind that continued cooking will occur helps to determine the perfect medium-rare or medium serving temperature. I was introduced to the reverse sear method in an America’s Test Kitchen cookbook. After learning about the advantages, its become my go-to way to cook thick cut steaks. I would love to hear your thoughts and if you’ve found success with this method, let me know in the comments section below. The reverse sear method might change the way you cook a thick steak forever. The process involves baking in the oven followed by searing on a pan. Place a large 12-inch cast iron skillet in the oven to warm, on a rack below the center rack. Use tongs to turn the steaks on their sides to cook and render remaining fat, about 2 minutes total. OPTIONAL: Add one tablespoon of the butter to the pan, melt and use a spoon to briefly baste the tops of the steaks. Transfer steaks to a clean plate and allow to rest at room temperature for 10 minutes. 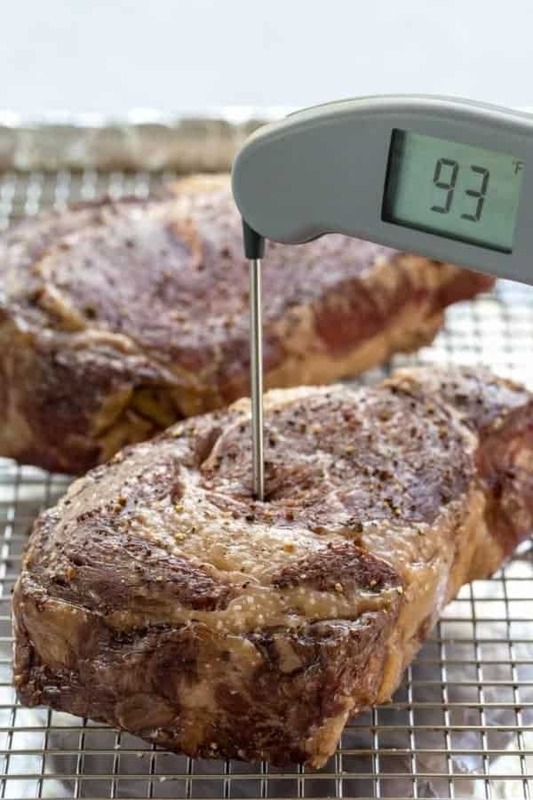 When steaks are in the oven, check the temperature of the steaks using an instant-read thermometer at 15 minutes, then every 5 minutes until target doneness is reached, 90 to 95ºF (32 to 35ºC) for medium-rare, or 100 to 105ºF (38 to 41ºC) for medium. MAKE IT DAIRY FREE: Omit the butter. MAKE IT PALEO: Use ghee instead of vegetable oil and butter. definitely going to try this one. I am drooling while reading….and it is early morning! Gonna go get me a big thick juicy steak for dinner. I will let you know how this turns out. I can’t wait to hear what you think about the reverse sear method Cathy! I just learned about the reverse sear method. I am definitely going to try it. ; makes a lot of sense.I will also try this method with the barbecue. Next to Alton Brown, you are one of my favorites. How did reverse searing work with the barbecue? I’ve tried this method and the steak turned out perfect. Thank you Jessica! Thank you for your feedback Rebecca! I’m curious, what type of cut did you cook? Can you share the make and model of your instant-read thermometer, please? The one I have is unreliable. Thanks much in advance! Yes! I have the thermapen MK4. It’s an investment but works so well. I don’t think I will need a new thermometer for a while! I am the worst cook in the world and using this method I can finally cook steaks that anyone would eat! I cooked boneless ribeye steaks and used bacon grease in the cast iron skillet to sear them…DELICIOUS! Thanks Jessica! Tried this tonight with filet and it turned out AMAZING!!! Thank you. I’d love to include a photo too if that’s possible. Interesting and makes perfect sense. I currently have a couple of filets in the sous vide and came across this by accident while looking into wine reduction recipes. What I like about this approach (which I MUST try) is that the oven should, indeed, dry the surface, making it easier to sear. The only thing I don’t understand is the list of temperatures you state for varying degrees of cookedness. They are well below any others I have encountered. For example, you say 90-95f for a medium-rare, whereas most other sources would suggest somewhere around 125f. I realise that resting increases the core temperature, but surely not by that much? I would be interested to understand why your temperatures are so much lower. Agreed. Just did this and took steak out at 103 F and when I was done searing it wasn’t over 120. I like my steak a nice 135 F when resting. I’ve used this specific recipe several times over the past couple years. Steaks are always perfect! I can’t wait to try this recipe tonight on a 1.75″ dry aged ribeye. Thank you for the very well written article/recipe. Edit: perfect results! Thank you again! I finally have the perfect recipe for a 2inch steak! I cooked a top sirloin steak to medium with this recipe and it was the best steak I’ve ever cooked. Now I have confidence that I can cook a thick steak indoors. I followed the recipe exactly-I cooked the steak for two minutes on each side in the pre-heated skillet. I’m having guests for dinner tomorrow and will be using this recipe! Thank you! I’m so proud of you Suzanne! I’m excited for your guests to tasted your professionally made steak! I like my steak rare (almost mooing). What temperature would you recommend to get it to in the oven before the sear? Hi Bruce- Rare is about 120-125ºF after resting, so I would target 80 to 85ºF coming out of the oven, then stop cooking when it reaches 115-120ºF after searing in the pan. Let me know how it goes! This is the exact question I was going to ask. Thanks for the answer! I want to try this method to make steaks for my family for my daughter’s birthday dinner. Can I sear the steaks in batches (1-2) at a time in my cast iron skillet without affecting the outcome? There are 5 of us, so I need to make 4-5 steaks depending on the cut that I get. Thank you! Hi Kathy- Yes, you can sear then in batches. I actually think that would be better than try to overcrowd the pan. Let me know how it goes! We have used this method twice now and absolutely LOVE it! Tender, juicy and delicious! It is our go to method now. I tried your “Reverse Sear” method today. I experimented with a Tri-Tip, the results were PERFECT. The color, tenderness and flavor were 5-Star restaurant quality. This is perhaps the Best beef steak I’ve ever made. Can you do the reverse searing with a marinated steak? I was just looking at your marinade and would love to try both but not sure how it’ll work? Yes I think you can! Just dry the meat off before adding into the oven. Let me know how it goes! What’s your opinion about not using Nonstick cookware? What about Saladmaster ones? I have used the reverse sear method and it works very well. But the best way to cook thick steaks is to use the sous vide method. It’s pretty much like a hands free method. Just set the circulator to what temp you want, place vacuum sealed steak (or other meats) in water bath and just let cook for 1 to 1 1/2 hours. Pull steak out of bag, dry, reseason and sear over high heat in cast iron skillet. Perfect steak every time. I just got a sous vide and need to try it! What temperature do you set it at?